The Hand that Won’t Sign the Paper: Adani’s Stalling Project - Integration Through Media ....! It should be a sign for this Indian giant, a company that has done much to illustrate the ethical and moral bankruptcy in Australia’s political classes. Despite support stretching from Canberra to rural Queensland, lifted by the fantasy of job creation, Adani is yet to dig the earth of what would have been one of the largest mining complexes on the planet. For one thing, a downsizing was announced suggesting a more compact operation that would supposedly fly under the radar of detractors. From its initial, lofty ambitions of a $16.5 billion investment, Adani Mining chief executive Lucas Dow now suggests a less extravagant $2 billion reliant on existing rail infrastructure. Even here, the mission to establish a new coal mine seems grotesque given the dire warnings of the Intergovernmental Panel on Climate Change. While Adani mines, the world cooks. 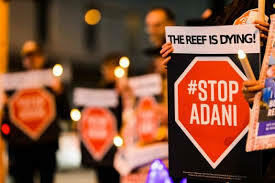 There is more than a sense that Adani is a poisoned chalice best avoided by all concerned – unless you are an Australian energy or resources minister incapable of evaluating history or the future prospects of fossil fuels. This point is particularly problematic given the admission by Indian officials that coal is going off the books at such a rate that the Carmichael project is destined to become the most muddle headed of white elephants. Indeed, existing thermal coal power in India costs twice what renewable generation does. Banks have refused to grant a line of finance. Insurance and reinsurance companies have resisted supplying cover for the coal mine – among them, AXA, SCOR, FM Global, QBE and Suncorp. Some insurance companies – Allianz, Munich Re, Swiss Re, Zurich and Generali – have environmental policies that preclude engagement with the project. The hope for Adani is that various ditherers and the morally lax might still be in the market to cover this enterprise of pure environmental buccaneering: US re-insurer giants such as AIG, AXIS Capital and Berkshire Hathaway have yet to make their stance on this clear. Such reluctance was prompted, in no small part, by the efforts of 73 environmental organisations, topped by a letter to 30 global insurance and reinsurance companies sent earlier this month. Such groups have been unrelenting in emphasising the dangers posed by the Carmichael project. These do not only entail the mining operations themselves but the rail line linked to the export terminal that would threaten the Great Barrier Reef. Biodiversity and a World Heritage Site remain vulnerable targets before a company renowned for its rapacity towards worker and environment. Other animals have also become talismans of resistance to the project, assuming titanic proportions for opponents. The Black-throated finch has become something of an activists’ cult, marked by the Black-throated Finch Recovery Team’s insistence that Adani’s reassurances in their protection and preservation are, at best, woeful. A promise to conduct surveys twice a year hardly counted, and the experts were being given the cold shoulder in what was deemed a “closed book consultation”. Adani insists on those who sing appropriate tunes. Then there is a sticking point that refuses to go away: Adani’s promised, seemingly unquenchable thirst. Up to 12.5 billion litres of water drawn from the Suttor River in central Queensland is being sought to aid the open-cut coal effort. The misnamed Environment Minister’s portfolio, inhabited by the near invisible Melissa Price, did not feel any pressing concerns for conducting an assessment on how damaging such a move would be. Again, Adani is there with qualifiers and dismissive counters, which are hard things to pull off, given the persistent trouble of drought in Queensland: the issue of the mandatory water trigger, which comes into play in such significant projects, should only apply to water used in the coal extraction process, rather than its overall plan of water usage which it has conveniently softened as a water strategy. As the Australian Department of the Environment and Energy explains, “stand-alone proposals which involve only associated infrastructure, such as pipelines, are not captured by the water trigger because they do not directly involve the extraction of coal”. Such bureaucratic riddling does well in Canberra. The Australian Conservation Foundation is not impressed, and is taking the matter to the Federal Court. By not considering the issue of how broad the water trigger was, Price had erred in a matter of law. As things stand, Price and her colleagues, in connivance with Adani, are erring on a lot more besides, making the campaign against the mine a fundamental counter against permissible and ultimately scandalous environmental vandalism.